Thousands of people awaits the spectacular opening of the London Games, as a fly-past by the Red Arrows marked the start of the pre-show. 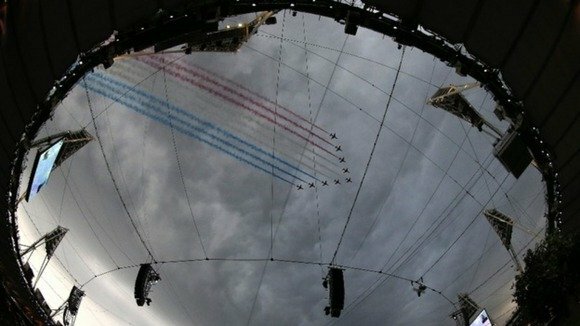 The nine RAF jets flew over the Olympic Stadium at the symbolic time of 20:12 BST, amid cheers. The three-hour spectacle will be viewed by a TV audience of one billion people. Details of the ceremony remain a closely-guarded secret. Its artistic director, Danny Boyle, has dedicated it to the 15,000 volunteers taking part. Danny Boyle has spoken of his “excitement” for the ceremony, which is named the Isles of Wonder, as well as feeling “nervousness” for all the volunteers. The Oscar-winning film director said the ceremony “might surprise people… it’s spectacular, but also inclusive – it has a warmth”. The chairman of London 2012, Lord Sebastian Coe, said he was “as excited as hell”. Crowds of people, many of them dressed up in their nation’s colors, are gathering in large numbers at the Olympic Park. Transport to the stadium appears to be running smoothly and the crowds are moving quickly through security. Rain has started to fall over the stadium, despite forecasters predicting dry weather ahead of the ceremony. The day of celebration began at 08:12 BST with a mass bell ringing. Big Ben rang for three minutes for the first time since King George VI’s funeral in 1952.